The private pool, in Pressignac-Vicq near Bergerac (Nouvelle-Aquitaine), had to be completely drained before the emergency services were able to begin the rescue. The operation was documented on the sapeurs-pompiers’ (fire brigade) Facebook page. 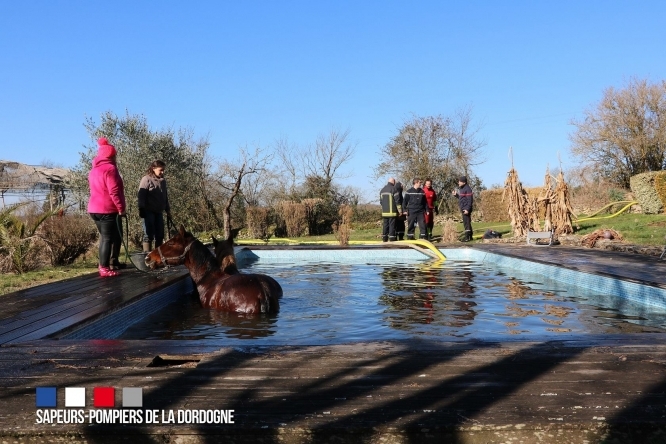 Photos show the horses being coaxed out of the pool, via “steps” made from hay bales. The animals became stuck after reportedly escaping from their enclosure and accidentally falling into the water. Their owners called the emergency services after it became clear that the horses were unable to get out themselves, as the pool had no steps. A vet and a blacksmith were also called to the scene, in case the horses needed medical aid. The rescue went successfully, however, and the animals were not hurt in the process. They were able to return to their enclosure shortly after the incident.